This morning was an eye appointment and the last appointment for either of us this year. I have started making a list – not even checking it twice – just trying to sort all these projects. It won’t get finished today, but I’ll have a good start. My hope is that you have wonderful plans for 2015 as well. Without plans, it’s difficult to move forward. Did you think I could really do it? I was wondering for a while, but just kept pecking away. Right now the table is clear – at least until the next project starts. And this is the bonus. 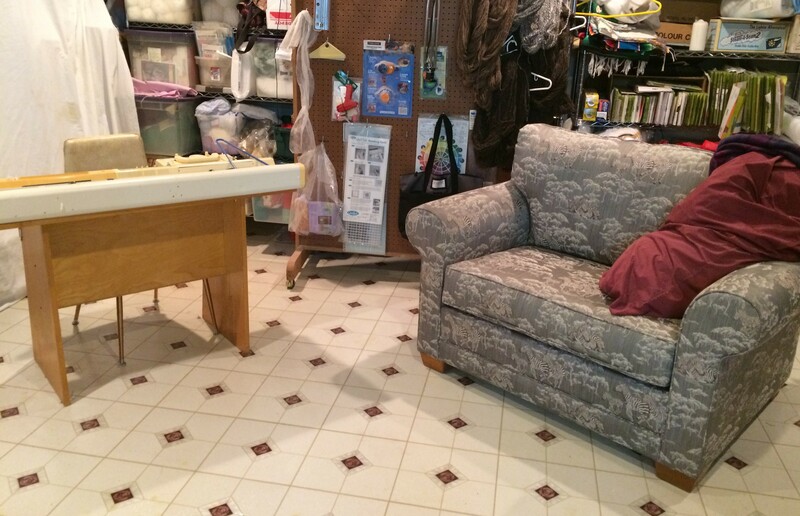 The adjoining room is ready for me to set up my knitting machine and learn how to machine knit. I’m excited to be able to have the space. The couch is so Bill can come and join me in the studio or for when I get tired. I want to put more sheets across the back so when I’m working, I’m not distracted by thinking up other projects. Do you ever wish you could just order something and it would land on your doorstep immediately. I do, but it never happens. Consequently, I ended up at Office depot for our new wall calendar, at Joann’s for storage boxes, and the grocery store. That took care of the morning. And since I knew you would be wondering if I made any headway, after lunch, I came right down to the studio and started. 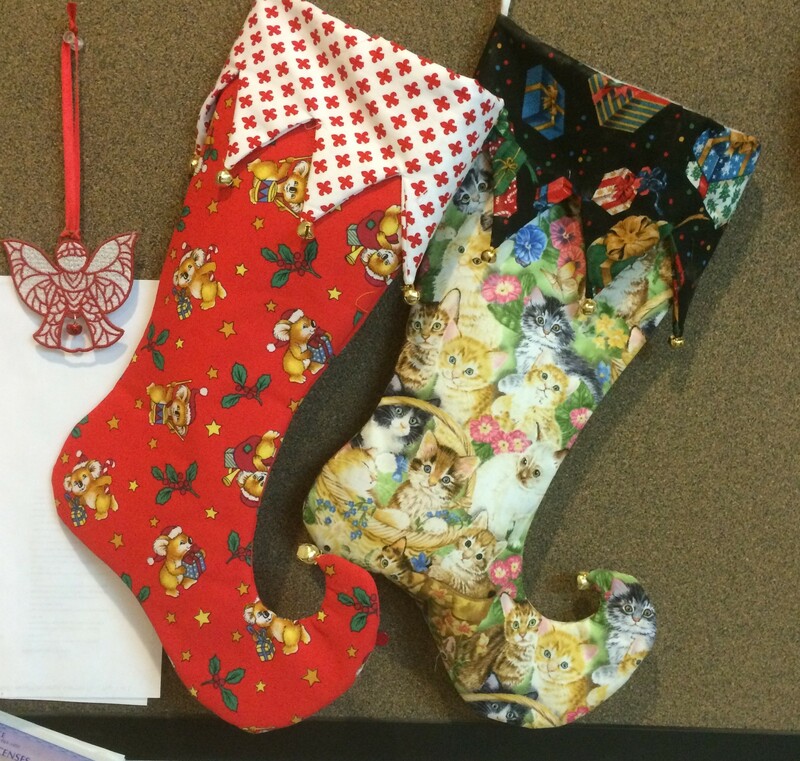 I found projects I had totally forgotten about and a lot of fabric that had not been replaced after making the quilts. Now the last part is done and I need to make a new list of projects. I still have a few minor items to decide what to do with. I’m thinking the ice cram bucket of old jewelry parts just may go to freecycle. I don’t see any need for most of it. And then again, I could stash it on a shelf – NO! that’s what got me in this situation to begin with. It will have to go. And see this box under the cutting table. 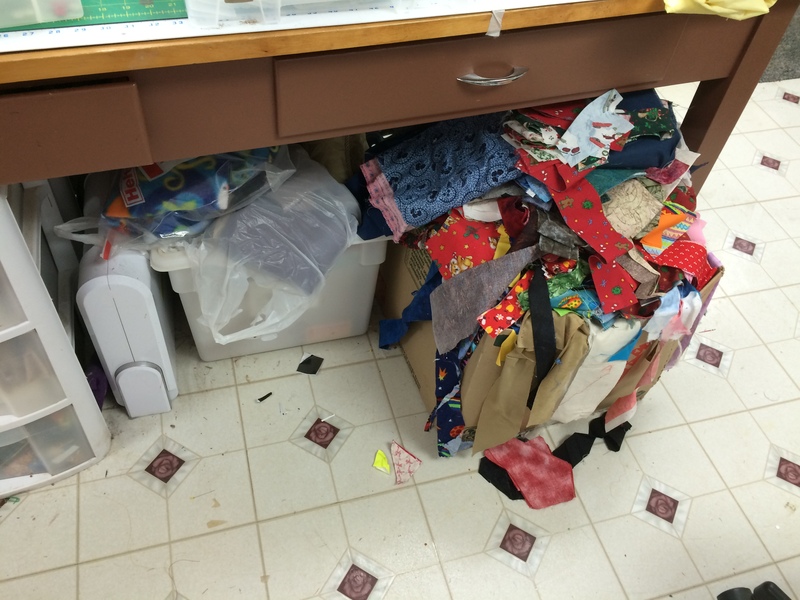 Those are all scraps that need to be cut into squares and rectangle to make other quilts. (There are actually two boxes of scraps, but the second one has fabrics other than cotton) And speaking of that, I should put on my list to make more scrap quilts So tonight I’m going to bed feeling like I did get a bit done. And tomorrow, I’ll try to find time to start my list of “to do”s. Maybe by New Year’s, I’ll even have time to make a list of what was achieved this year. I know it doesn’t match last years list, because some things did get done, but others were added. 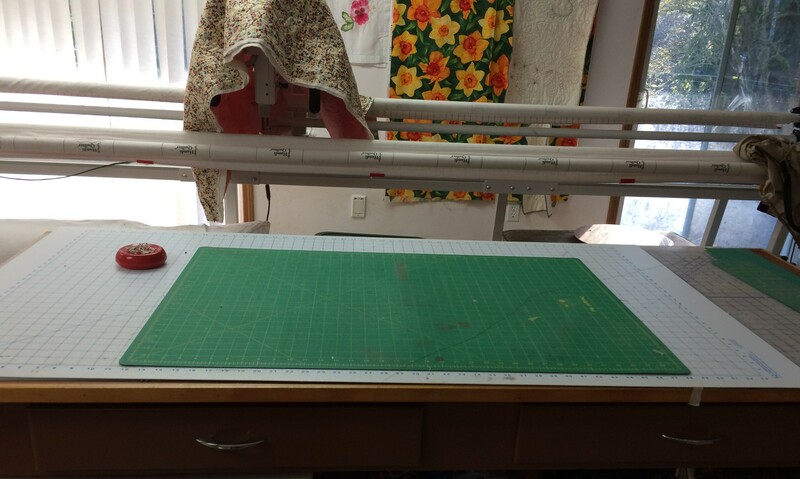 Today, I thought it would be a great idea to put all the fabrics together in one place and open up one room for my knitting machine which I plan to start using sometime in January. There were things on the top shelves that Bill helped me get down so we could get the racks through the doorways. Honestly, even though I know I put them up there, I don’t know how I did it. But then it was awhile back. In the process, I pulled several items that will need new hones. So now my room looks like this. 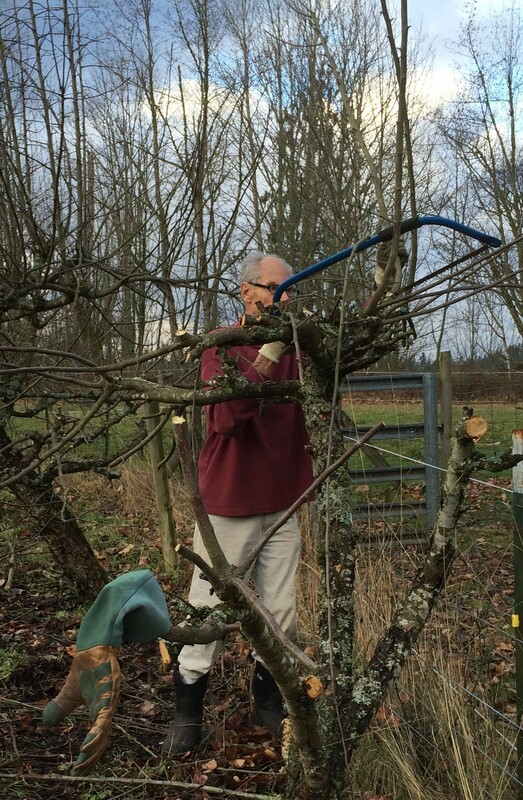 And we are a bit late pruning the apple trees. It will be in the 20’s at night for the next 10 days, so hopefully being late won’t be such a big deal. However they have started budding so we may have a very small crop this year. Oh, and neither one of us knows any more than we found on the internet, so we may be doing it wrong. 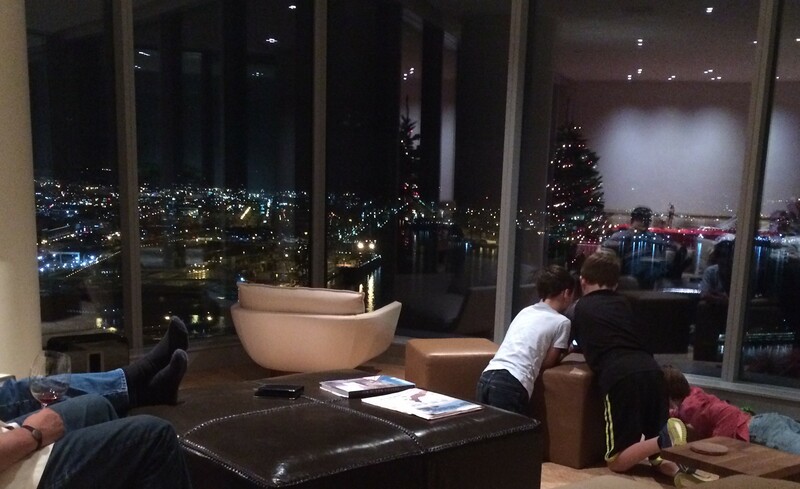 We did one tree today – with a dozen trees, we may be at this for the next 2 weeks. Here are the before and after photos. I’d like to share with you the daily audio Bible, an easy way to learn more what the Bible says. It is non denominational, free, and Brian (the voice) simply reads some from the Bible. Each day includes some OT, some NT plus a Psalm and a bit from Proverbs. At year’s end the entire Bible has been read. I have found it very convenient to have on my iPhone or computer to listen to when I’m not sitting down. For instance, I like to listen to it on the iPhone when doing my steps. 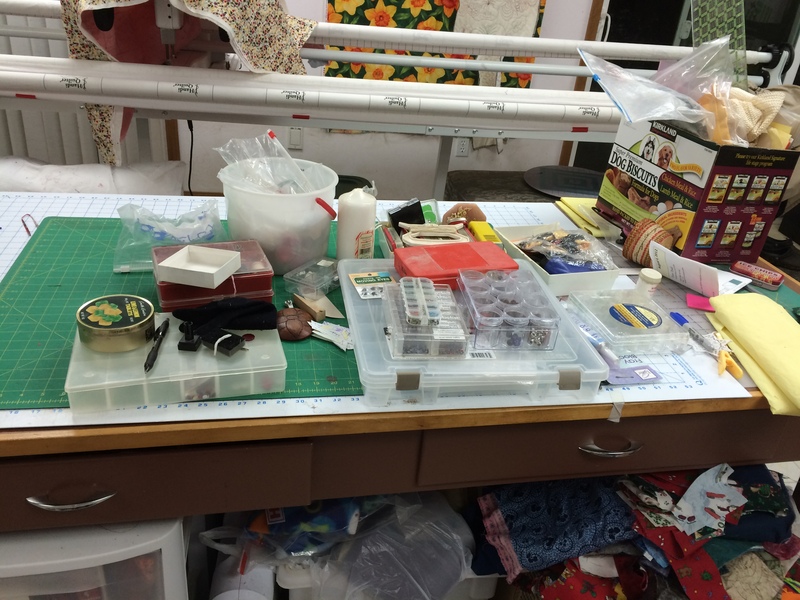 However, if I am in the sewing studio, it is on the computer for me to listen. He’ll be starting at the beginning again January 1st. These are the socks that don’t want to get done. 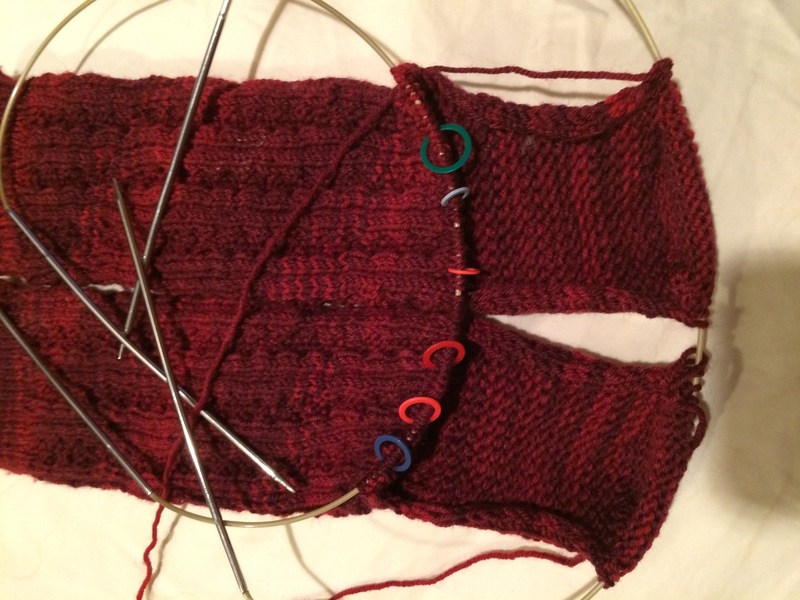 They are on a 1 needle and I just finished the heel turn, so they will be a carry over into next year, or maybe even set aside for a while. This is the week that I usually spend putting everything away and getting ready to start the new year’s projects. 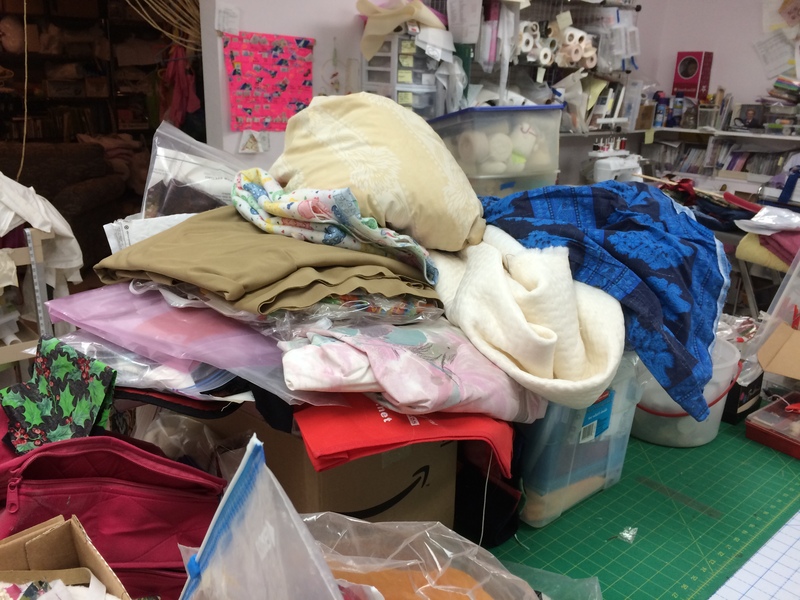 Since I started sewing for Christmas mid year, most of that material is put away. Today, I was going to put the doll items away when I thought this would be a good time to go through all the shelves and clean out, sort and shuffle. So that is exactly what I started today. 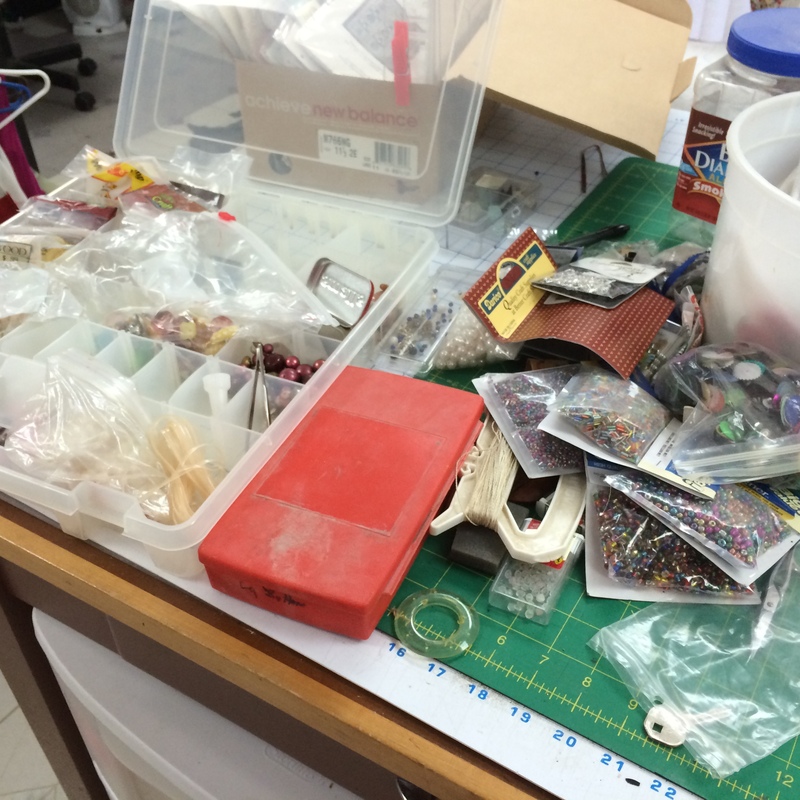 These beads still need to sorted, but I need to get another couple of boxes to sort them from JoAnn’s. They will go on the third shelf and I will know where everything is and that it is all together. I thought I had it that way, but when I went to find bells for the elf stockings, I found it was only mostly that way. And things had strayed which needed to be put away. Are you doing any special cleaning before January 1st? It was dark last night, so these are not brilliantly lit. 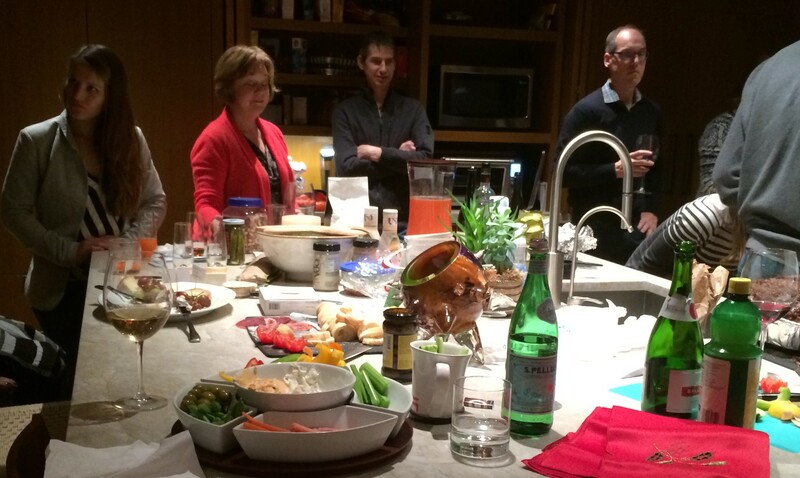 The first is the serving area and the second is the 180 degree window. Everything you see outside the window is water reflection. To my surprise she had it done and gave me a copy to download for my Christmas. (over 1400 photos) So at her house today, some of us enjoyed going through the photos as the she and her sister, Lisa, made annotations of who were in the photos and where the photo were taken. She had them in somewhat of chronological order. So what we viewed today were photos of me and siblings and Bill as children with our parents. It was very entertaining. Of course we will have to have many more sessions or I will have to learn how to do some of this on my computer so we can share. I do hope that all of you had a very good day as well. MERRY CHRISTMAS to each of you. I wish you and your family: health, peace and happiness this coming year. May we each be blessed with the knowledge of why we celebrate this season. I have been busy here in the studio, but have only one thing to show you. Here are the stockings that I made for Darrin’s fireplace. They were fun to make even if I did create a huge mess looking for the bells. He is hosting the Christmas party and his fireplace was just a bit bare. 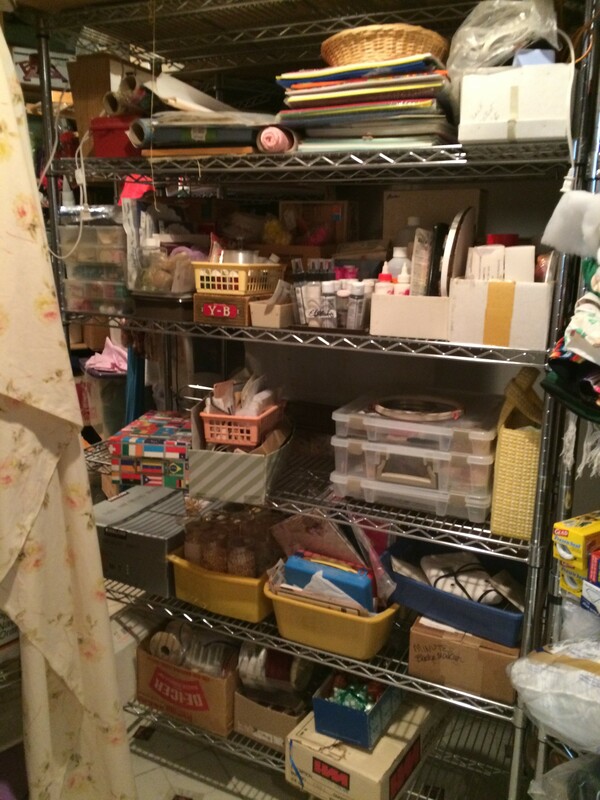 Well, at least the craft stuff was pulled out in an effort to find what I knew I had somewhere. I looked in the correct box, but didn’t see those bells way in the back. They are now found and used and I will sort through and label the rest of the items before returning to the shelves. That should keep me busy for a while, especially since there are some small Christmas items to finish first. 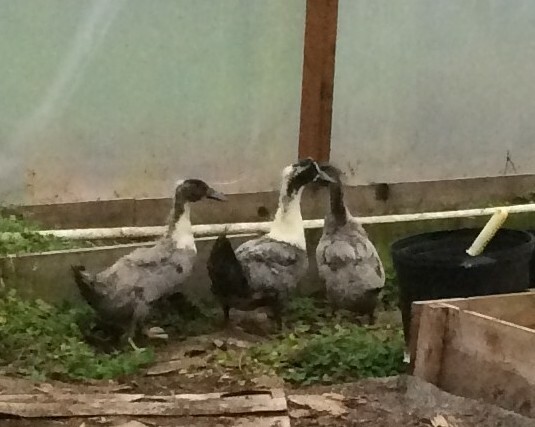 Look at how the ducks have grown. 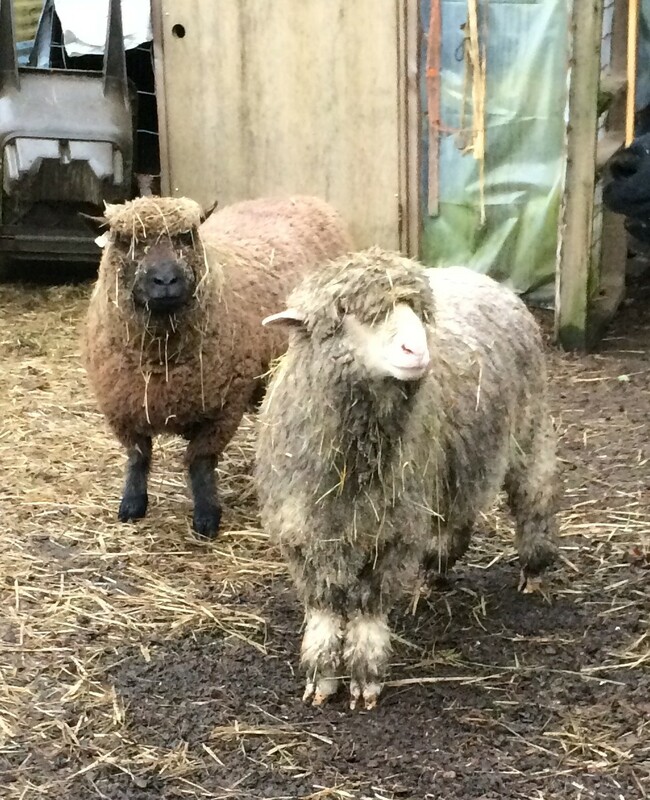 and now for a brown and a white sheep in dirty clothing. Today was a perfect day to be outside gardening here in the PNW. The sun peaked now and then, the temperature was about 50 with no wind. With all these daffodils and a few tulips to plant, it was time to get going. 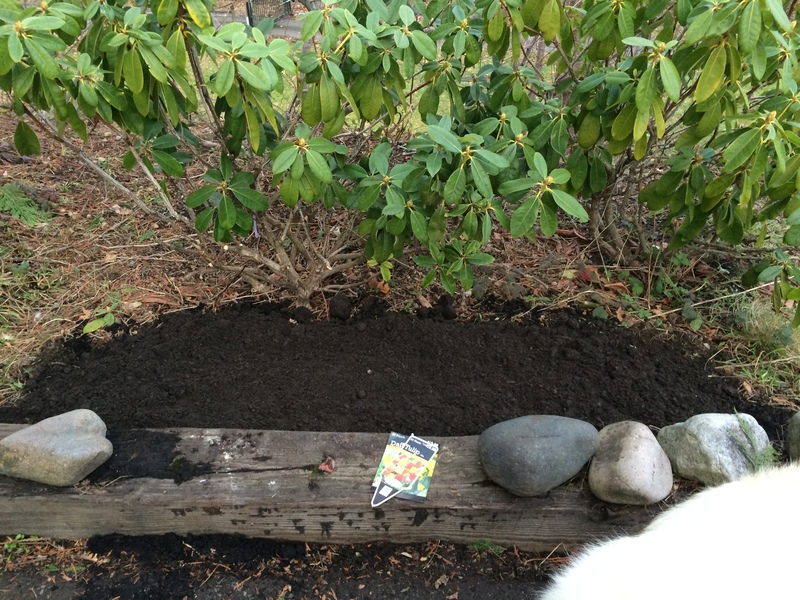 So I worked a spot in front of our 3 rhododendron bushes which is also right next to the asphalt driveway. It is a spot that only has color when the rhodies are in bloom. This year the plan is to plant nastursuims as soon as the soil is warm enough. The railroad tie is about 8′ long and the dark spot is where I plant. It was such heavy clay that I could only dig far enough down to barely cover the daffodil bulb Yes I know they and the tulips according to the package are supposed to be 6″ deep. But I didn’t have that much soil, so after I finished getting all 25 of the bulbs in the ground, we put a couple of bags of topsoil over the them. I would really like a color spot there. 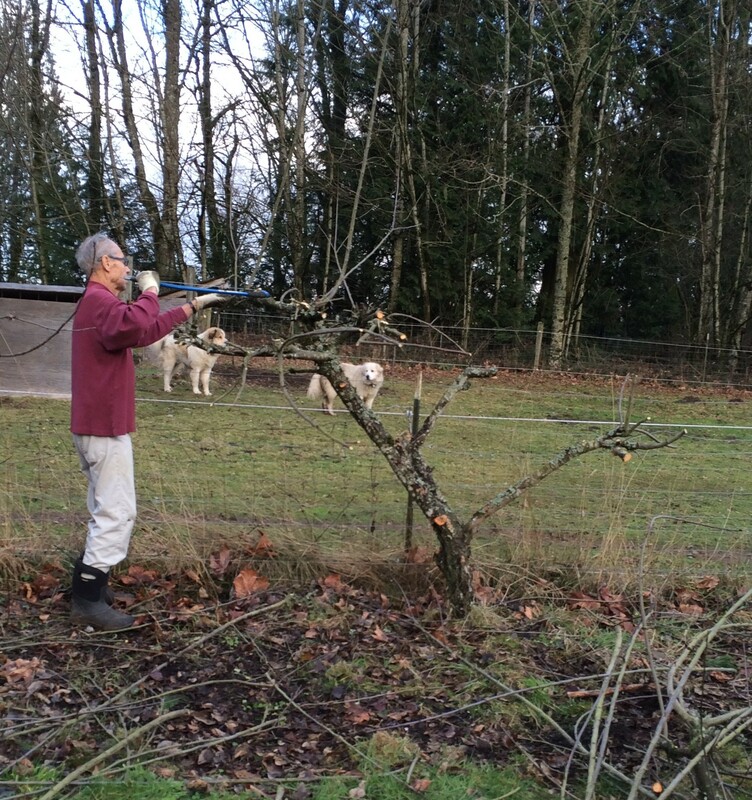 In looking for the shovel (which I ended up not using), I went down to where Bill was adding chips to the muddy area by the chicken coop. When I called him, the little lost duck answered me. It took a bit, but we were finally able to catch him and reunite him/her with the siblings. What a relief! 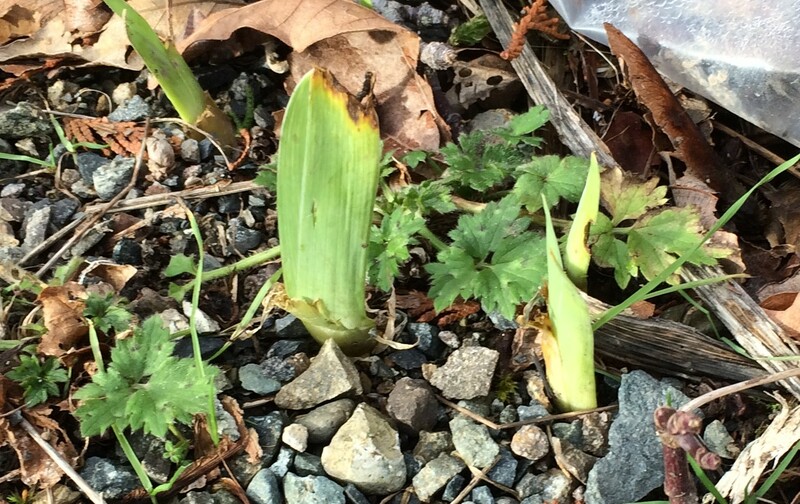 It is only December and already these iris bulbs have started sending up shoots. They have been in the cold ground, so I’m surprised they are in such a rush It is fun to watch the new life arrive. They must want spring as much as I do.